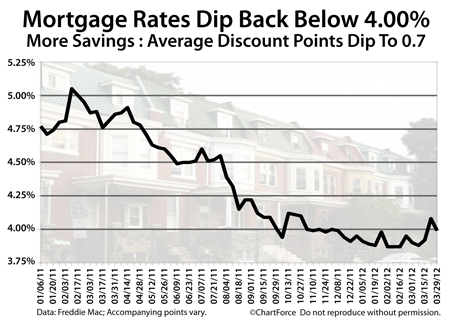 After a brief run-up two weeks ago, mortgage rates are back below 4 percent. It’s good news for home buyers and mortgage rate shoppers of Franklin because with lower mortgage rates come lower mortgage payments. As a real-life example, a $200,000 Hendersonville mortgage with an accompanying 0.7 discount points would be subject to an additional $1,400 one-time closing cost. Last week, that cost was $1,600.